Chow Yun Fat passed away for unknown reasons very unexpectedly 9/5/09 and we are very sad to lose this special boy. 5/14/09 I'm no longer special needs. I had a sty on my eye and am getting it all fixed up. I'll be ready for you soon! Hello. My name is Chow Yun-Fat. It might be easy to confuse me with the film star of the same name--both of us are handsome, enjoyable to watch and the ladies love us. I don't know about my human counterpart, but I'm going to be neutered soon. 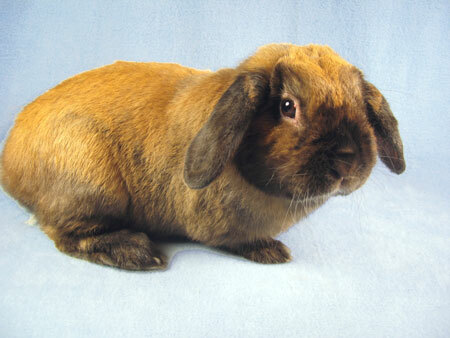 I'm a REALLY nice, Holland lop boy. Very loving, sweet and eager to be loved. I just arrived at SaveABunny and will soon have a veterinarian examine a small growth on my eyelid. That's the main reason I was on the rescue list at a local shelter and not able to go up for general adoption. SaveABunny offered me safety and a chance to be loved and adopted and that is what I want. I don't need to be a famous movie star. I just need to be a star at your house. Please sponsor my veterinary care and/or best of all---adopt me!